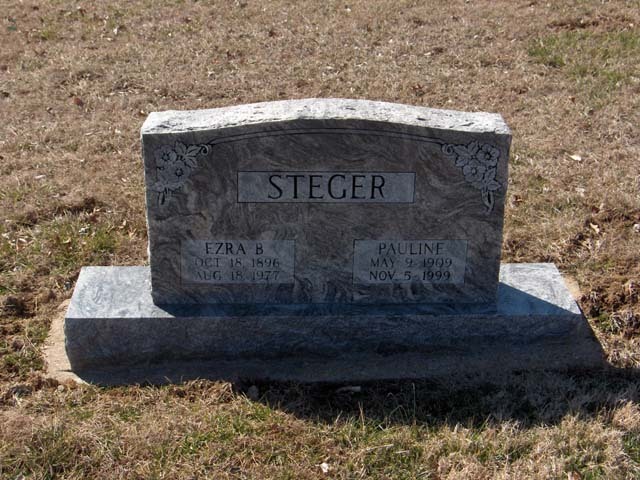 Pauline Steger Oehlert, 90, of Marble Hill died November 5, 1999 at Jackson Manor in Jackson. She was born May 9, 1909 in Own Co., KY, to Thomas William and Nancy A. New Parker on July 4, 1943 she married Ezra B. Steger, who died in August 18, 1977. She later married George Oehlert and he preceded her in death. She was a member of Southern Baptist faith. Survivors include two sons, Phillip R. Steger of San Diego, CA; and Ray R. Steger of Marble Hill, MO; two daughters, Phyllis A. Moyers of Jackson, MO; and Geneva E. Hamlin of Whitewater, CO; a brother, John W. Parker of Cincinnati, OH; a sister, Justine Glass of Knoxville, TN; six grandchildren and five great-grandchildren. Also preceding her in death were a brother and a sister. Funeral services were held Monday at Liley Funeral Home in Marble Hill with interment in Bollinger County Memorial Park.